Reading has been one of my favourite past times ever since I was a kid. I really do love nothing better than getting stuck into a good book. One of my absolute favourite authors as a kid was Jacqueline Wilson. I absolutely loved her books (and still do!). Lola Rose, The Story of Tracy Beaker, Illustrated Mum, The Suitcase Kid, Midnight and Double Act were just some of my favourites and I used to get lost for hours in the pages. 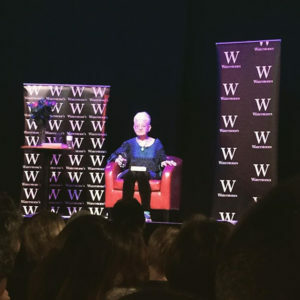 When it was announced that Waterstones were to host ‘An Audience with Jacqueline Wilson’ at Exeter Corn Exchange, Emily and I jumped at the chance to go and see her talk. When we sat down amongst the audience, the first thing that struck me was how many children were there with their parents. It sounds silly but I expected more people my age who used to read her books in the Tracy Beaker days. It was so heart-warming to see so many children enthralled by her and clutching her latest book, eager to get reading. There was a girl sat near Emily and I who looked exactly like a young Emily. 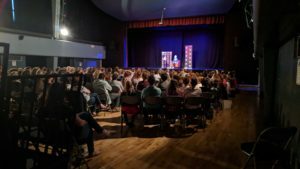 With ginger hair and glasses, she began reading her new book before the talk had even started – it was so cute and so Emily! Walking out onto the stage, Jacqueline looked exactly the same as she did at the back of our old books. Short grey hair and colourful clothes, she didn’t look like she had aged at all and it was so surreal to see her right in front of our eyes! Beginning with how she got into writing, Jacqueline said she’d always been a storyteller right from when she was a little girl. She used to collect these little doll figures from Woolworths and create stories with them, making them play out the adventures that were forming inside her head. She also loved the stationary section of any shop. She’d go and find the best, prettiest notebook so she could begin writing down her stories. From then on, she was always writing stories and every time she hit a wall and couldn’t finish one story, she’d go out and get another pretty notebook and pen so she could start all over again! It was fascinating to hear her talk about her love for writing and how she gets started with a story. She said that she always used to start a story with absolutely no idea of where it was going or how it would finish and still writes like that to this day. When she started talking about her school life, I could so relate to her! Obviously, she loved her English lessons and loved her teacher, Mr Townsend, who was always interested in reading her stories, but never quite got the hang of maths. Her dad used to try and help her with her maths homework and get so frustrated with her when she wasn’t getting it that he used to make her cry! I found this quite funny as that was exactly me! To this day, I still can’t get my head around certain aspects of maths and my dad used to try and help me but would get so frustrated when I couldn’t do it, we just used to end up arguing! When Jacqueline moved up to secondary school, she faced her first critic in the form of Miss Pierce, her new English teacher. Jacqueline had a very different style of writing to Miss Pierce. She was funny and humorous whether as Miss Pierce was very much formal and proper. Jacqueline even thinks that if Miss Pierce was to read one of her novels now, she would still be itching for her red marker pen to make annotations all over the pages! Once she’d finished school, Jacqueline started her career at DC Thomson’s in Dundee, Scotland after they put a call out in the London Evening Standard for teenage writers to write funny stories for a magazine they were preparing to launch. Jacqueline wrote a story about a girl attending her school disco and all the boys are asking her friends to dance but no one came up to her. So the girl decides to go and stand at the side of the stage where the band was playing, pick the best looking member of the band and start to wave and smile at him, pretending that he was her boyfriend! DC Thomson loved it so much that they offered Jacqueline a full time job, writing the stories for this teenage magazine. Some of you may even know the magazine. It was called Jackie and apparently it was named after her! After working at DC Thomson, Jacqueline threw herself into her novels and wrote many before she got her first story published in her 20’s. It was called Ricky’s Birthday and was aimed at children who were just learning to read. Her real break-through to fame was when The Story of Tracy Beaker was published in 1991, later being picked up by the BBC for a television series starring Danni Harmer – me and Emily were obsessed with that show much to our mum’s dismay! It was captivating how Jacqueline talked about her career and her novels. She was so charming and a great storyteller – you can see why she is such a successful author. She said that her favourite characters are Tracy Beaker and Hetty Feather, those are the two she holds a special place for in her heart. She thought that Hetty Feather was such a nice, unusual name but that she actually had a lady write a furious letter to her one day claiming that Jacqueline had stolen her name. 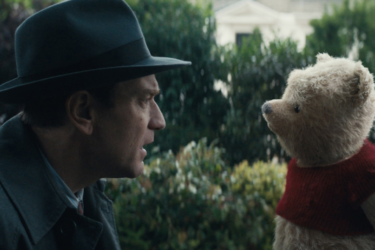 Sure enough, the letter was signed Hetty Feather! I used to love how Jacqueline’s books were quite gritty and hard-hitting. They addressed teen issues such as bullying, mental health, puberty and adoption which has come with controversy from critics but also an abundance of praise from her readers. Recently, she’s been setting her books in the Victorian era, claiming it’s quite fun to go back in time and write historical books for a change. My favourite nugget of information from the evening was when Jacqueline said that she’d be a bookshop owner if she weren’t an author. She fondly revealed to the audience that if ever she can’t get to sleep at night, she’d start imagining how she would set up her bookshop and even think about the finer details, right down to which books she’d have where in the shop. I thought that was so charming! Emily and I both loved the talk and it was such a privilege to go and listen to one of our favourite childhood authors talk about the books we know and love. As I said before, it really was lovely to see so many children enthralled by her. In a world of tablets and smart phones, I do really worry that children are going to stop reading books so it enhanced my faith a bit! Thank you Waterstones and Exeter Corn Exchange! 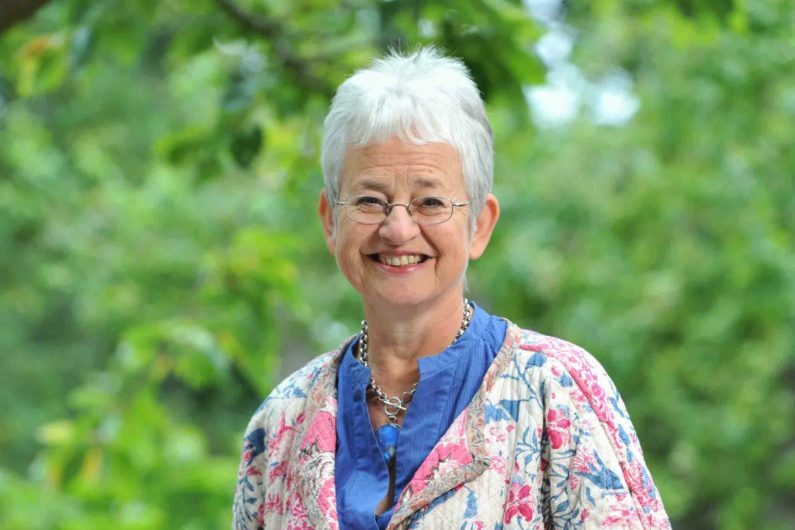 Did you used to read Jacqueline Wilson books? Let me know which one is your fave in the comments below or tweet me @SheWhoLives1!